I bake cakes pretty regularly. With two " growing" boys who are forever hungry they also get polished off real quick. Several variations which include Plain cakes, Rainbow cakes(No fuss chocolate cake), Choco banana cake, Muffins get made every other week. Once you have got your measures and baking time right it is really easy. And the best part about baking a cake is that you just have to mix all the ingredients together( whether in one step or in stages) and then the dish cooks on its own. So set the timer to bake( usually 200 degree celsius unless the recipe specifies otherwise) and go ahead with getting the rest of your meal ready. Tarts and pies on the other hand seem a lot more complex. I used to read and re-read short crust pastry recipes but could never really muster up enough courage to bake them. I am most impressed with people who can make a decent apple pie. Apple pies have the " Wow" factor. You never quite get that response with a cake however complex the ingredients or labored the process. But once you have baked an apple pie successfully you will realize that it is actually pretty simple. Like with most other baking there are three easy steps: The crust, the filling and then assembling. That is it, you are done. There are of course tips to bake the perfect pie, best learnt when you actually watch somebody bake( Food shows on TV/Demos on the Internet come fairly close- the latter you can watch over and over again till you get it right). Tip #1: Always use ice cold water which is ice to which a little bit of water has been added. Tip #2: Once you knead the short crust pastry dough, wrap it in a cling film and keep it in the refrigerator for at least 30 minutes. This is supposed to "chill the butter and relax the gluten"- not sure what that means but sure works. Tip # 3: Mix the apple with the sugar, cinnamon, lime juice and let it stand for at least 30 minutes. The apple will give out water which you can separately thicken and pour back. If you skip this step and directly bake the apples will shrink and you would end up with a large gap between the baked apples and the top crust. Tip#5: Excellent plain but even better with vanilla ice cream or whipped cream. Thank you " A" for sharing your recipe, that was the starting point, got tweaked as I progressed. Incidentally the best apple pie that I have had was the one baked by A. Start with the crust. Mix the flour, butter, sugar and salt together. Add water 1tsp at a time and slowly mix the dough till it is firm. Should hold together when pinched. Wrap the dough in a cling wrap and refrigerate. For the filling: Macerate the apples by mixing the apple, cinnamon powder, sugar and lime juice. Let it stand for about 30 minutes. The apples would give out water. Drain in a colander and thicken the juice on the stove/microwave with some butter and add to the apples. Alternately( and this is what I did) just put the apples with the juice in a pan. Cook it on slow fire till the sauce thicken. Transfer into the pie dish and trim the edges. This, is the only difficult step and don't be disheartened if you don't get it right the first time. Blind bake the crust in a pre-heated oven for about 5/7 minutes at 200 degree celsius. 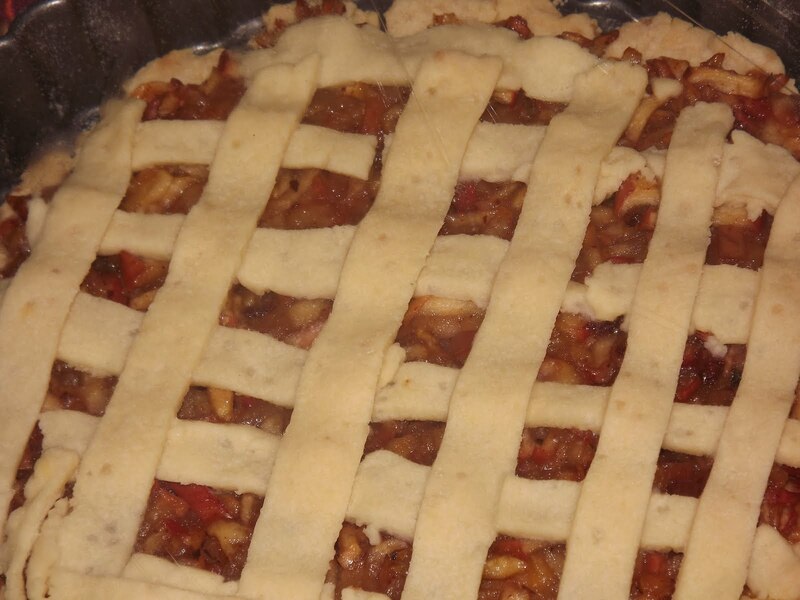 Next, sprinkle some flour and place the apples on the crust. Roll out the remaining dough into a circle and cut into thin strips. Place the strips vertically and horizontally as shown in the photograph to form a criss- cross pattern. Bake at 220 degree celsius for about 45 minutes. Pat yourself on the back for having mastered the recipe. Get creative and try making the filling with other fruits. I have been on a high since the time I baked my first apple pie. Plan to try my hand at Tarts and Quiche next. So wish me luck! Bon Apetit and Happy Baking! I always wanted to bake one....but didn't know which was the best recipe...this is good...u do all the research n we get the best one so easily ;) Thanks!! Looks really yum. Had tried it couple of times in the past but was not satisfied with the outcome. Now with expert tips, should give it a try before sonny leaves else i will not have the enthu cos there are no hungry growing up boys here !!!! Stanley ka dabba....Happy Friendship Day!